We would like to introduce an important addition to your product range, our new Framing Fasteners product line. We offers a wide selection of fasteners to connect components and accessories to profiles using the T-slot. All fasteners are designed for quick, easy installation and have a large surface area to provide strong, secure fastening. Also, many have grooved surfaces to resist loosening and provide ESD protection. The full line of fittings brackets and specialty components as well as associative materials and components are easily bolted (or machine screw fitted) to the open face of any channel section with a vise like clamping action which delivers tremendous pull out and slip resistance. The screws/nuts are generally positioned with an appropriate size or style spring (although springless styles are preferred by many). 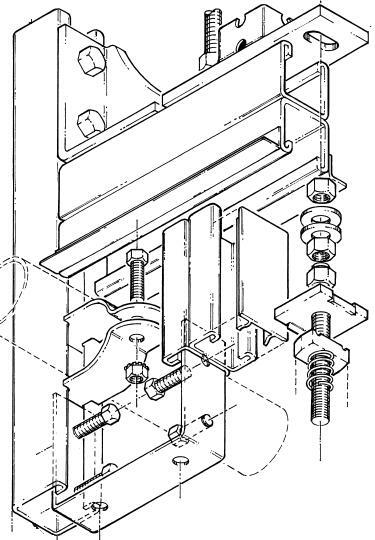 Aligned parallel with the open slot, the screws/nut (A) is simply pushed into the channel and turned perpendicular, it automatically pushes back against the in turned lips of the channel with a positive locking action (B). The fitting is then aligned and easily positioned by merely moving the nut along, (C). Tighten to complete the peration. PEAKSIGHT provides the Estimating, Design, and Engineering direction required to take non-standard component applications such as X-ray and Hospital Equipment Supports and Laboratory Cabinet Framing Systems from concept to reality. With years of design and construction expertise, Specialty Engineered products fabricated with the same quality control as our standard industry recognized components can easily be designed into the most sophiscated of applications. Our framing fasteners can be supplied with steel class 8.8 and stainless steel AISI 304 or AISI 316. Further types can be offered on request.